But what does the last requirement mean? "Reinforcement Renji Abarai Damage dealt by Main Character is no less than 1 of total damage"
He needs to x amount of damage. Use uno and turn on your zanpak it should help drastically. 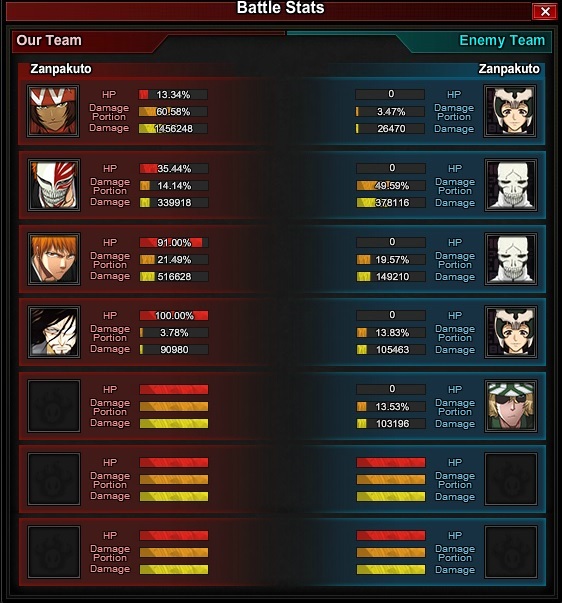 Wait, the Reinforce Renji needs to get 30% damage? I can help. Way I passed this one was have your 3 supporters with basically nothing on them. Your main needs to hit first and use the 8th skill to wipe out the enemy assaulter line. Then the enemies will attack, then renji will hit the enemy vanguard. Next your main will attack again and kill the enemy vanguard, and will combo so renji will attack the enemy supports. This should get you past the stage. Ichi not above 30% dmg. I've passed mine after like 20mins of trying different set ups. Thanks for the advice. I think my main needs more bp to wipe the first line by himself. I've mostly been training the 9th skill and not the 8th. GMT-5, 2019-4-19 07:21 , Processed in 0.022105 second(s), 9 queries , Xcache On.